How much would you pay for an old television listings magazine? On Monday, a 1972 edition of Radio Times sold on eBay for £360. It originally cost 5p, so that’s one helluva mark up! You might not be able to check what’s on anymore but it sports a snazzy and much copied cover by legendary comic artist Frank Bellamy. 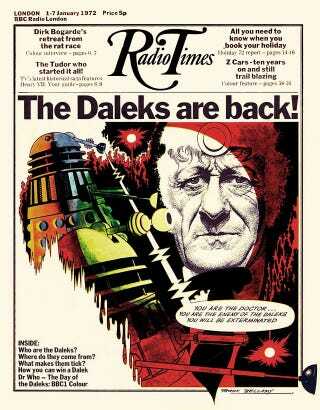 It also marked the return of the Daleks to our screens after a five year absence. The illustration shows two Daleks interrogating John Pertwee’s Third Doctor during Day of the Daleks, kicking off a new four-part adventure in Doctor Who. Back in the day, Radio Times made great use of illustrators to illuminate upcoming programmes on radio and television. Bellamy was one of an army of artists who provided spot illios for features and listings. Others included Eric Gil, Biro, Peter Brookes, John Gilroy, Hunt Emerson, and Eric Fraser. Bellamy illustrated myriad shows and films for the publication, including Orville and Wilbur, horror movies, gangster movies, and Star Trek, but his Doctor Who spots stick in the mind with a dynamic persistence. Colony in Space, Terror of the Zygons, Ark In Space, and Planet of Evil all received iconic images to entice viewers. Outside of the pages of Radio Times, Bellamy had an impressive portfolio of comics and advertising work. He drew The Daily Mirror’s adventure strip Garth between 1971 and 1976. He drew Swiss Family Robinson, King Arthur and Robin Hood for Eagle’s younger brother Swift and Ghost World and Wrath of the Gods for Boy’s World. At Eagle, he produced some notable biographical strips, including The Happy Warrior, Montgomery of Alamein, The Shepherd King and The Travels of Marco Polo as well as the stunning Fraser of Africa. He endured a politically difficult year replacing Frank Hampson on Dan Dare (producing some stunning covers despite problems with the studio system that centered on the strip). Frank Miller’s 300 probably wouldn’t exist if Bellamy hadn’t drawn Heros the Spartan for Eagle. Bellamy also imprinted the world of Gerry Anderson’s Thunderbirds on a generation of readers in TV Century 21 and later produced a series of diorama images for Letrasets’s Action Transfer series.